6. Poor corrosion resistance to be corrupted. 7. Not suitable for application which is exposed in high temperature conditions. 1. Sintered NdFeB magnet(Neodymium-Iron-Boron) rare earth magnets are the strongest magnets in the world up to date, with high fluxdensity and high coercivity, the range of energy product is 26--48MGOe. 2. 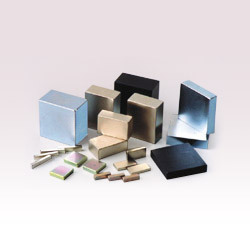 Sintered NdFeB magnets are anisotropic and only magnetized in one direction. NdFeB magnets are Widely used in Motor, separator, lifting, sensor, loudspeaker, MRI, VCM, and other electronics, automation systems.